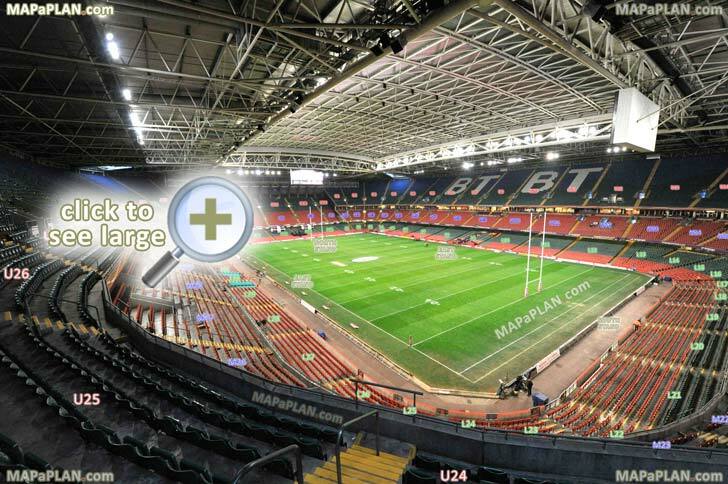 What are the best seats in the Cardiff Millennium Stadium? 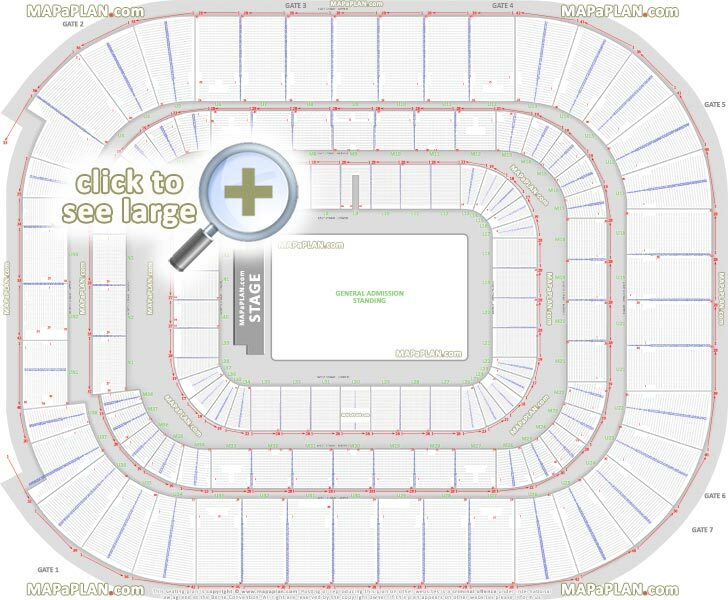 In the end-stage concert configuration the best view is either from the General Admission standing area or the first rows in the East or West Lower stands - blocks L7, L8, L9, L32, L31, L30. The standing area is set on a flat ground so if a tall person is standing in front of you the view may be slightly obstructed/restricted. The South Stand or the back rows in the standing area offer a view of the entire stage, however at a considerable distance so you will probably not be able to see the facial expressions of the performer. For some events the General Admission area is removed and the entire ground forms a sports pitch (e.g. football, rugby, speedway). Overall, there are four stands in the stadium - North, East (BT), South, West. These are set on three levels of inclined tiers (Lower, Middle, Upper) so even the back rows can enjoy an unrestricted view of the stage/pitch. The North Stand has only two tiers: Lower and Upper - known as the Cardiff fault or Glanmor's Gap. 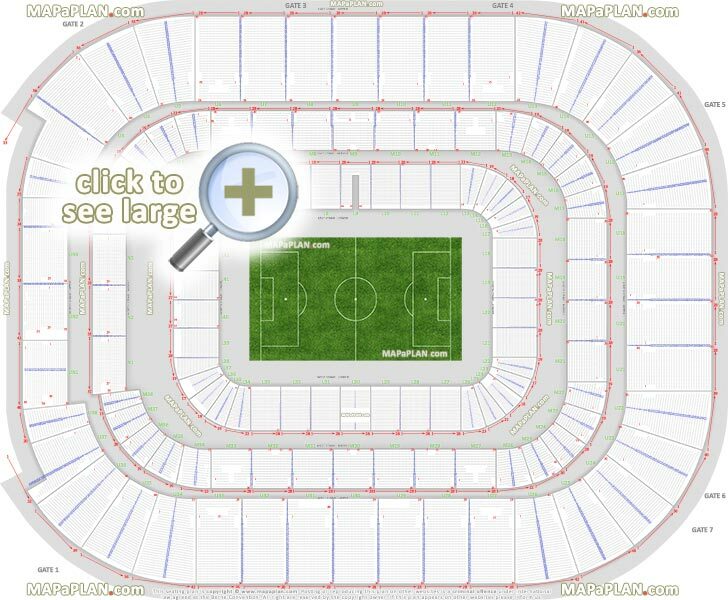 The blocks in the stands are numbered L1-L42 (Lower stands), M1-M38 (Middle), U1-U38 (Upper), and additionally N1-N4 & UN1-UN4 (North Stand - Upper). Row numbering is from 1 up to 36 in some upper tier sections. Seats in all blocks are numbered from 1 up. Seat #1 is always closer to the block with a higher number. The exact seat numbers are shown on our detailed floor maps. What are the block numbers in the Cardiff Millennium Stadium? General Admission - This is typically a single standing area, however for some events it may be subdivideed into smaller standing or seating sections. 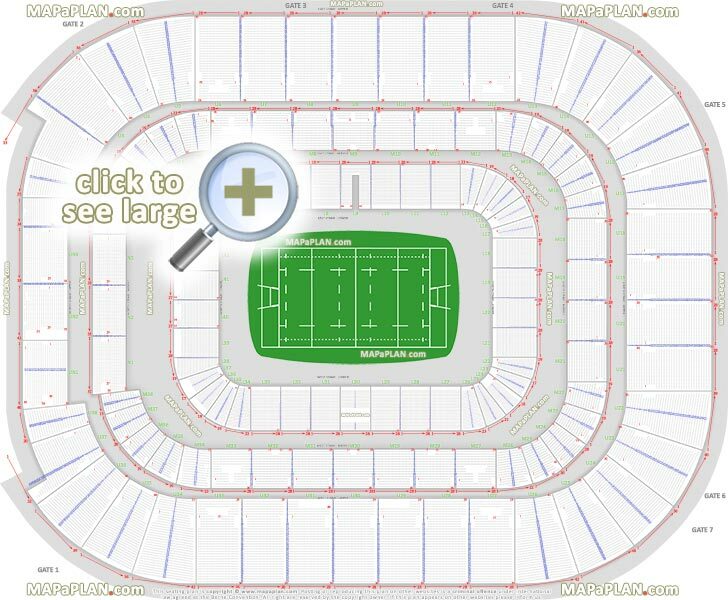 How many rows are there in the Lower, Middle and Upper stands in the Cardiff Millennium Stadium? Lower stand blocks have rows from 1 up to 27. Middle stand blocks have rows from 1 up to 15. Upper stand blocks have rows from 1 up to 33, with the exception of the North Stand which has rows from 1 up to 36 (1, 2, 3, 4, 5, 6, 7, 8, 9, 10, 11, 12, 13, 14, 15, 16, 17, 18, 19, 20, 21, 22, 23, 24, 25, 26, 27, 28, 29, 30, 31, 32, 33, 34, 35, 36). What are some of the biggest acts that will be performing or have performed in the Cardiff Millennium Stadium?